A Crucial Week: TPT Back to School Sale - at least 20% off everything in my store! TPT Back to School Sale - at least 20% off everything in my store! It's that time of the year again - online sales time! Teachers Pay Teachers is having a site-wide sale on Wednesday 1st and Thursday 2nd August. I'm having 20% off everything in my TPT store. 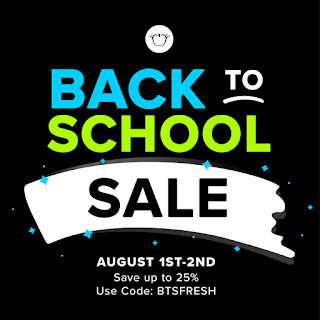 In addition to that, TPT is offering another 5% off when you use the promotional code BTSFRESH at the checkout (Just make sure to select "Apply a Promo Code"). It starts at 4:01am GMT (Irish time!) on 1st August and finishes at 3:59am GMT in the early hours of 3rd August. However, I've decided to have 20% off everything in my store from now until the sale begins. I've created some new categories to help make browsing easier. The "Irish Classrooms" category is for anything that might be of interest to Irish teachers (and not stuff for international schools).